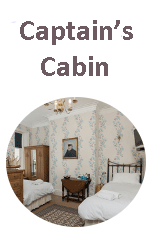 The Captain's Cabin has flexible booking dates, just £45 per night (min 3 nights) or can be booked by the week (Saturday start). Add The Captain's Cabin to your Apartment booking and enjoy a special low weekly rate of just £150. To do this simply book the apartment first, adding The Captain's Cabin by ticking the option on the booking form.